One woman's dream for a cultural tourism hub on the Navajo Nation. "My dad wanted boys," says Alberta Henry, sweeping open the door to the lofty new hogan on her family's land near the eastern entrance to Grand Canyon National Park's south rim. For now, aside from a few traditional shade arbors, an outdoor cooking area, and an outhouse, the hogan is the only structure on this 50-acre property where Alberta's family has lived, hunted, and held ceremonies and family gatherings for five generations. But on the table in front of her are artist's renderings of what she hopes the land, with its panoramic views of the Little Colorado River gorge and well-preserved rock-art panel, will someday become: a cultural tourism destination complete with traditional hogan lodgings, campsites, RV parking, a general store, a café, and an outdoor amphitheater. Alberta plans to attract tourists from the nearly 900,000 vehicles that shuttle past each year on the popular Highway 64 corridor — which connects Little Colorado River Navajo Nation and Marble Canyon Navajo Nation parks and Grand Canyon National Park — by offering a hidden getaway where guests can enjoy traditional Navajo foods, storytelling, dancing, and entertainment, set out on guided hiking and horseback tours, and experience the Navajo "lifeway." "My dad worked for Peabody for 40 years. He was a welder. And he got four girls," Alberta continues, smiling. "What do you do when you get four girls? You make them welders." Alberta laughs. She's quick to laugh — it's one of the first things you notice about her — and although she's alone at the hogan today, her family is never far from her mind. Out the hogan's door — like all hogan doors, it faces east, to welcome the rising sun — juniper, cedar, and piñon trees cast small shadows in the early morning light. Alberta just got off the night shift, but you'd never know it by the way she moves around the hogan, making sure everyone is comfortable before settling down herself. The hogan is unusually large and sits on the northern end of a clearing. Built by her brother-in-law as a surprise for her sister last November, the walls and ceiling of the octagonal dwelling are immaculately paneled in pine, and inside it feels cool, light, and airy. Two ceiling fans hang overhead to help distribute heat from a wood-burning stove in colder weather. "My sister was married in here,"Alberta says. Alberta herself was married in this spot, in an older incarnation of the hogan whose foundation still lies under the dirt floor of the new one. An even bigger hogan once stood a short distance away. "My family has lived on this land for 100 years," says Alberta. "We call it Big Hogan because there used to be a really big hogan up here, bigger than this one. My great-grandmother had 14 kids. My grandfather, his name was Frank Bilagody Johnson. He went to school until the eighth grade — not a lot of kids did at his age — so they called him Olta Nez ("Long Education"), because he could read a newspaper. He and my grandma, Grace, had 14 kids. Ten lived, and they raised them here. When we have family reunions, about 200 people come. We butcher sheep, sometimes a cow. We don't get our meat from the store." Alberta herself has four children, including two daughters in college and a son who will graduate high school next year. "Then we started back over," Alberta jokes, speaking of her 2-year- old son. Petite, youthful, and neatly made up in traditional turquoise earrings and sporting a Big Hogan T-shirt, 42-year-old Alberta might not look like the stereotypical welder. "Me and my sisters, that's what we grew up doing," she insists. The work often took Alberta out of state, and she worried her kids would lose their connection to family and to Big Hogan. "I decided I needed to move home so that my kids could have stronger roots and grow up here and learn about this area. So me and my husband quit our jobs, I withdrew my 401k, and we moved our home back to Cameron." To support their family, Alberta and her husband both found jobs with Peabody Energy. Alberta works the night shift as a driller and shooter at the Kayenta Mine, on Black Mesa, some two hours away. "We drill holes and put dynamite in there and move the earth so we can dig for coal," she explains. To make sure she arrives in time for her 4 p.m. shift, with weather and traffic unpredictable on reservation roads, she leaves her home at 1 p.m. She gets off at midnight, returning home after 2 a.m., long after her 2-year-old has gone to bed. Her husband works the day shift at the mine, and, between commuting times and conflicting sleep schedules, the pair barely see each other. But all that driving gives Alberta time to think. "I saw those hogans in Monument Valley that people were renting and I said, 'maybe I could do that.'" From that small seed has sprouted a project that has consumed nearly every available waking hour of Alberta's life for the past three years. During this time, the Grand Canyon Trust has worked alongside Alberta, supporting her through the complex process of acquiring a business-site lease from the Navajo Nation, developing the cost and revenue models and other financial plans necessary to create a prospectus, and producing a promotional video to help attract investment. Culture-based entrepreneurs like Alberta have few avenues for traditional financing. To remedy this, we are working with Alberta and several culture-based ventures to gain access to new types of impact investment featuring a mix of grants, low-interest financing, and investment. Tourism on Navajo land is estimated to be a $1.7 billion a year industry, but the Navajo Nation captures only a small fraction of that. Fewer than 1 percent of visitors stay in Navajo-owned bed-and-breakfasts like the one Alberta hopes to break ground on at Big Hogan. 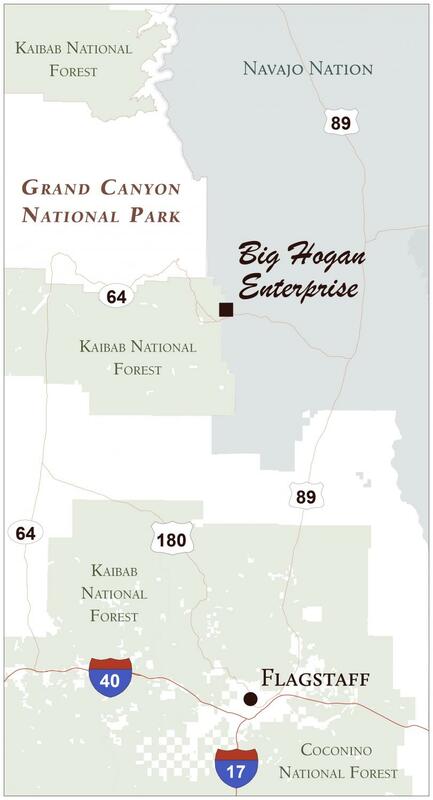 Nonetheless, cultural tourism destinations on the Highway 64 corridor have the potential to relieve overcrowding at nearby Grand Canyon National Park by spreading some of the park's 6 million annual visitors east, and to inject much-needed revenue into the Navajo Nation's economy, where an estimated 38 percent of residents live below the poverty line. Alberta picks up one of the two artistic renderings that capture hers dream for Big Hogan, and points out the Hummingbird Information Center, where she plans to provide educational information about the Navajo Tribe, Navajo Code Talkers, and efforts to protect the sacred confluence, and a gallery where she'll sell Native-made jewelry and crafts. "This is a really unique place. People who come here, they fall in love with it," Alberta says. She hops into her truck to take us out to Big Hogan's private overlook. We pass the remnants of a táchééh — a traditional sweat lodge — nearly a hundred years old. At the trailhead, she points out a stump whose twisted branches resemble the rack of an elk. "We call this Elk Point View," she says. The rusted hood of a Model T is propped up nearby. "This whole area is like a little island that stands out, a plateau," Alberta says. An old Model T road that runs along the edge of the canyon is still visible in the rocky landscape. Alberta leads the way down a rock-lined path. The view opens up: the Little Colorado River gorge, Navajo Mountain, and the north rim of the Grand Canyon in the distance. "Way before my great-grandparents moved here, it used to be a gathering place for hunters, for the Navajo, the Hualapai, the Hopis, the Paiutes. The hunting parties would all gather here," Alberta explains. During the Long Walk, Navajos hid out in the area, and Alberta says you may still find apricot and peach trees near hidden springs. "There are stories that the Hopi, they built their homes with logs gathered from here and they built these rope bridges," Alberta says. "They would take those logs across back over to their side, probably a hundred miles. On Google Maps, if you look at the canyons real close, you can still see those rope bridges." With a permit from Navajo Nation Parks and Recreation, Alberta can lead hiking tours from Big Hogan all the way down to the Little Colorado River, where locals have told her about a hot spring called Blue Cove. "I haven't found it yet," Alberta says. She also intends to offer horseback tours and trail rides. With the drought, the piñon trees haven't gotten enough water to produce nuts this year, but a flowering bush called awee ts’aal is blooming at the overlook. "It's what we make baby diapers out of it," Alberta says, leaning in to smell it. "It's really soft." On the way back, Alberta points out cactus fruits, yucca, Navajo tea, and other edible and medicinal plants her grandmother has taught her about. "My grandma says, "I'm not going to be alive for very long. Remember these things because one day you're going to be starving, one day you're going to be thirsty." My grandma's name is Julia Johnson Curley and she's the matriarch of our family. In Navajo culture, the women lead the family. She knows all the stories. She's our rock." We climb back into the truck. When we get out at the last stop, it's nearly noon. Lizards sun themselves on the rocks. Alberta leads the way down a flight of steep metal stairs welded into the cliff. At the bottom, behind a long railing, is a massive rock-art panel. "There are a lot of petroglyphs in this area," Alberta says. "Our ancestors used to live underneath the overhangs. You can tell because of the smoke from the fires." She points up at the soot-stained ceiling. On the rock wall in front of her are dozens of petroglyphs and bright red pictographs showing elk and deer and rain. Some have been chipped off or vandalized. "There's pottery, there's arrowheads,"Alberta says. "I want to protect this place." Alberta will have to leave for her next shift at the mine soon. But as we prepare to leave, she turns in a slow circle, surveying the land, pointing out where visitors will sit in the amphitheater to watch traditional dances, as though she can see into the future. The coal Alberta helps mine powers Navajo Generating Station, which supplies electricity to pump water up and over the mountains to Phoenix, Tucson, and other desert communities. But the generating station is scheduled to close by the end of 2019, and the mine is expected to close with it. Alberta hopes, by then, Big Hogan will be up and running to support her family. She estimates she'll need about $110,000 to get her business off the ground, including $20,000 for showers and restrooms, $50,000 to build five guest hogans, and $25,000 for a solar array that will provide electricity to light the hogans and charge visitor's cell phones. "I'm trying to go green," Alberta says, "but going green is really expensive. Each of those compostable toilets is like $5,000." Big Hogan is certainly a family affair. "To build the hogans, we'll have a contractor leading us, but we'll be doing most of the labor," Alberta explains. Alberta's sisters and brothers-in-law will weld the signage, as well as a fence and gate. Her family will also help with hogan rentals, the information center, and maintenance, including driving a tanker truck to Flagstaff to replenish water an underground tank, once installed. For now, Alberta is starting small, hosting private groups of visitors. With the help of the Grand Canyon Trust, she's offered a "glamping" — glamorous camping — experience to a few potential investors. She sets up tents and bedding and provides meals, including a traditional blue corn mush breakfast, Navajo tea, and mutton stew with fry bread for dinner. Recently, the Trust helped Alberta connect with a group of tour operators from the international adventure-travel company G Adventures, as well as representatives from the company's non-profit arm, the Planeterra Foundation. Alberta hosted small groups for the night, offering tents and meals, as well as traditional storytelling and a guided tour. She hopes the company could funnel a few thousand visitors per year to Big Hogan. "I really enjoyed it," Alberta said of the Planeterra group. "We told them skinwalker stories. They were scared. Modern society has bedtime stories, well these are our bedtime stories." Alberta laughs. "It was so much fun. And I get to do it on my own time, and no one is bossing me around." She laughs again. "I get to spend time with my kids. My kids were here the whole time the group was here. And the group gave me some good advice at the end. They said, 'keep your family lifestyle, bring your kids, it's authentic.'" Alberta prepared separate meals for the vegetarians in the group and they recommended she also list those vegetarian options on her menu. They encouraged her to start with small groups, dry-camping as she'd done with them, even if it takes Alberta and her husband time to raise the money they need to build out Big Hogan. "It was $200 per person, and, at the end, they gave us a tip. I was so surprised," Alberta says, her eyes shining at the memory. "When I go to work, I just do my job and go home, then I get paid for it. And it's really good money. But they own me. I haven't had a day off this whole month. I wish I could just quit my job and do this. But my job pays for this. And we're trying to save money to build the hogans." Alberta's work has already attracted a small impact investment of $5,000. These funds will help her cover the cost of the archaeological survey the Navajo Nation requires her to conduct to ensure no archaeological sites are disturbed at Big Hogan. It's a significant undertaking and comes with a hefty price tag — $8,000 — but Alberta is cheerful about it. "I want to do things the right way," she says. "I want to build something that will last for me and my family. I want to help the kids around here get jobs and stay on the reservation." Alberta knows she'll need cleaners and cooks, guides and storytellers, and she hopes to spread the benefits of Big Hogan beyond her family to the larger community. "Once I start making money, I really want to give back, so that the people who helped me can help somebody else like me," Alberta says. "I want to be an example. If I can do this, you can do this. If you really want it. Every day I think about this. I was telling our first impact investor, when he invested the $5,000 to start, if someone handed me a large amount, I'd quit my job today. I'd come straight here and start." Grand Canyon Trust Native America Program Director Tony Skrelunas works to promote impact investing and support sustainable economic development, including utility-scale solar power, on tribal lands.